Kelowna First Aid is one of the premium training service providers of cardiopulmonary resuscitation (CPR) certification and re-certification programs in Kelowna. Boasting the largest selection of quality classes, affordable rates, and high-end training facilities, Kelowna First Aid has cemented itself as the best and most popular provider in the area. Full courses, stand-alone classes, and refresher programs are available throughout the week at various schedules. How Else Can I Contact This Workplace Approved Provider? You can use the following information to contact this provider about registration information, private classes, and training centres. Trainees who are able to complete a course are awarded a workplace approved training certificate, valid for three years. The certificate is renewable at refresher programs offered twice weekly at Kelowna First Aid. The certificate will surely meet whatever purpose the trainee needs it for. What classes can I register for? Applying ice to an injured knee for pain and inflammation. Full training courses for CPR have three levels, each level inclusive of basic first aid and automated external defibrillation (AED) training. AEDs are machines that are used to shock and restart the heart. Each level corresponds to a particular training certificate from the workplace approved. Stand-alone classes for CPR or first aid are also available if you do not want to enrol in the full course. Private classes are usually taken by big groups of trainees or companies who want to get certified. How much are the training programs? Kelowna First Aid comes with the cheapest prices for all courses within the Kelowna region. Rates include everything – taxes, certification fees, and training manuals so trainees don’t have to worry about additonal expenses. 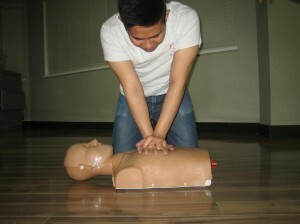 Course rates vary from 48 (CPR level A) dollars to 144 dollars (Standard first aid), depending on the type of program. Trainees who drop out are entitled to full refunds, provided a 72-hour notice was done. All classes are taught by workplace approved certified instructors in high end training facilities. You’re sure to get the best training with Kelowna First Aid! Alcoholism is a chronic disease that is manifested by inability to control drinking, preoccupation with alcohol, and alcohol tolerance. Alcoholics experience withdrawal symptoms when they try to decrease or stop drinking. This disease has several physical, emotional, and psychological effects on the drinker and the people surrounding him. First aid rescuers will often have to deal with the effects of alcohol abuse in rescuing victims, especially those who lose consciousness and suffer from persistent vomiting.